A year ago, my wife Sarah and I had the amazing opportunity to attend a Sposi Novelli audience at the Vatican and have our marriage blessed by Pope Francis. It was a very long journey, and almost didn’t happen. Not long after we were engaged, I took Sarah to Philadelphia to show her around the city where I’d spent most of my adult life and meet some of my closest friends. Over dinner one night, we were discussing honeymoon destinations when my friend Kasia said, “If you’re going to Europe, you should go the the Vatican and get your marriage blessed by the Pope. We did, and it was amazing!” Kasia and Adam then told their story of weddings in Philadelphia and Poland, and having their marriage blessed by Pope John Paul II during a Papal Audience on their honeymoon. We still had a lot of wedding planning to do, and put that on our list of possibilities. About a month before our wedding, we lost Sarah’s dad unexpectedly. It was a tremendous shock, and cast a bit of a shadow on the happiness of starting our life together. We had discussed a few honeymoon options, but a trip to Italy and the Vatican just seemed like the right thing to do. So, we started planning our trip. 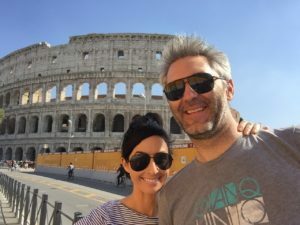 We took all of the miles we’d been saving and bought airline tickets to Europe, blocked out the calendar at the office, and booked our week-long whirlwind tour of Italy with a layover in London. Information on the Sposi Novelli Audience was tough to come by and pretty inconsistent. All we were able to find out was that we had to visit within 3 months of being married, and show up in our wedding attire. It didn’t seem that daunting, until Sarah’s passport disappeared from her purse at work one day. We had to get her a replacement, which turned out to be quite the ordeal. A typo on her driver’s license that hadn’t been an issue the last time she’d renewed her passport became a bureaucratic mess requiring multiple visits to the passport office in Los Angeles, San Luis Obispo, the DMV, and an expediting service to help us sort it all out. Meanwhile, we’d heard back from St. American Community in Rome (formerly at Santa Susanna). 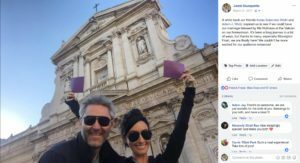 They were happy to provide us with tickets to the Papal Audience if we emailed over a copy of our marriage convalidation document from the church, which we didn’t have. Fortunately, my dad told Monsignor Frost at Christ the King Church of our plight, and he agreed to help. During our expedited marriage classes (we’d already been legally married for a few months), I asked, “Monsignor, do you know anyone who’s had their marriage blessed at the Audience?” He said, “Nope. I’ve heard about it, but don’t know anyone who’s actually done it.” He then told us about his Holy Year pilgrimage to the Vatican, and of sitting next to newlywed couple during the Papal Audience who weren’t able to meet the Pope because of some small detail they had forgotten. Thanks to Monsignor Frost, the amazing ladies in the Christ the King office, and our new best friend Solomon at the expediting service, we were able to email our certificate to Italy and get Sarah’s passport just a few days before our trip. 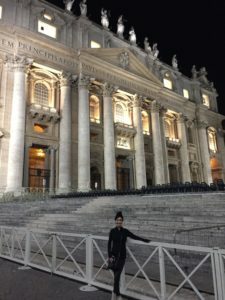 The email from Santa Susanna informed us that we had to pick up our tickets at the parish office Tuesday afternoon, so our itinerary put us into Rome on Monday evening. We spent most Tuesday seeing the sights and eating our way around Rome. We decided to take a tour of the Coliseum so we wouldn’t miss any of the highlights by wandering around on our own with a tour book, which had the added benefit of being escorted to the front of the line. As our luck would have it, our tour guide was late. About halfway through the tour, we decided to take off and head to St. Patrick’s to get our tickets. We didn’t want to take any chances with traffic, transportation, etc at that point. So we hopped into an Uber and cruised across town. Riding around Rome with a local driver is definitely an adventure, especially up and down the winding and hilly streets around the Coliseum. The short trip in a Fiat felt more like a ride-along in a rally racer than a cab. Our driver expertly maneuvered through the afternoon traffic and dropped us off right in front of Chiesa di Santa Susanna alle Terme di Diocleziano (Church of Santa Susanna at the Baths of Diocletian), which is right across the street from the Fontana del Mose, and the Chiesa di Santa Maria della Vittoria, which is known for amazing Bernini sculptures. We which we knew we had to check out after picking up our tickets. The parish office was modest with all of the signage and notices written in English, which was nice after a week of using Google Translate. The pastor sat behind a metal desk with a list and a stack of purple tickets. We introduced ourselves, and he nonchalantly handed us our tickets, with an information sheet. 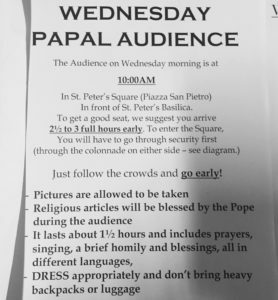 In a monotone voice, and pointing to the photocopied sheet, the priest said, “OK, make sure you get to the Vatican 3 hours early to get through the security line and get a good seat. But if you’re late, just cry a lot. That seems to work, too.” We laughed and thanked the priest, giving him a bullet-point version of our story and making a donation to the parish. Judging from his reaction, he’d heard it all. We could hardly contain our excitement as we left Santa Susanna. We had every intention of going across the street to visit Santa Maria della Vittoria, but after seeing the Pantheon, the Coliseum, Trevi Fountain, San Luigi del Francesi, and the prior three days in Venice and Florence, we decided to skip the Bernini sculptures and go to the Baladin brewery to celebrate instead. St. Peter’s, all set up. were done taking chances with logistics, so after enjoying an amazing dinner of porchetta sandwiches at a hole-in-the-wall restaurant we saw on Anthony Bourdain’s show The Layover, we walked to Piazza San Pietro to make sure we knew where we were going and how we were going to get there with Sarah wearing her tall wedding shoes on cobblestones. It was our first view of the Vatican, and with the evening lights, the scale of the place is breathtaking. The square was already set up with barriers and chairs, giving us a good idea of where we needed to be the following morning, and how close our Uber driver would be able to get us. 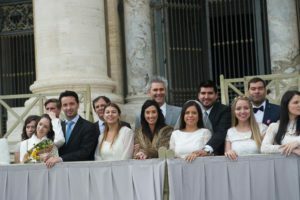 The day of, we woke up early, put on our wedding attire, and made our way to the Vatican. It was crowded, even in the off season! We showed up 2 hours before the audience, and there were already huge lines at the gates. Luckily, one of the Swiss Guards saw us in our fancy duds and escorted us to a separate line, through the metal detectors, and passed us on to a Papal Gentleman waiting on the other side to usher us to our seats. He dropped us off at our seats, which were right in front of the steps at St. Peter’s Basilica, right next to the spots reserved for the Bishops and Cardinals. There were only about 20 couples there to be blessed, and just two couples from the United States. There were newlyweds from Belgium, France, Italy, Colombia, Brazil, Croatia, and others. We were seated next to a lovely couple from Guadalajara, who helped us get a few good photos in front of the crowd. The crowd filled in, and became very animated when the Holy Father came through the mass of people, greeting and blessing everyone as he and his entourage made their circuitous way to the pulpit. The audience started with greetings in 5 languages, with acknowledgments of groups of the faithful who had traveled from around the world on parish-organized trips, including the newlyweds. Papal gentlemen passed through our section, handing out cards with blessings on them as mementos of the occasion. The Holy Father gave a brief sermon in Italian on the topics of temperance, tolerance, and mindfulness that was translated into various languages by bishops from their respective countries. The translations were summarized and a bit shorter than the sermon. As the translations ended, the papal gentlemen returned and ushered us to another section. We really didn’t know what to expect, and our new friends from Guadalajara told us that they were moving us so we could meet the Holy Father. The papal gentlemen lined up all of the newlyweds behind a barrier while His Holiness took his time meeting all of the VIPs, followed by the newlyweds. We noticed that he appeared completely engaged and focused when making his individual greetings and blessings, and the atmosphere could not have been more respectful. The papal gentlemen gave us a short briefing, telling us to put our phones away, as photographers from the Vatican Observatory would make sure they took excellent pictures of everyone with the Holy Father. Everyone waited patiently, knowing their turn would come. Finally, he came to us. We stood there in mild shock as we were immediately humbled. We were there to have our marriage blessed, but instead, were asked to pray for the leader of the Catholic Church. It made perfect sense. His job is bigger than we could imagine. And the moment had passed. 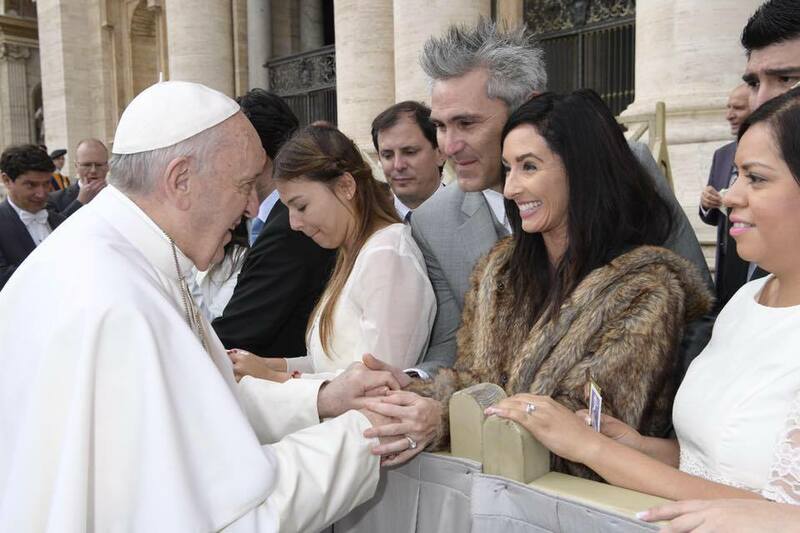 The Holy Father thanked us for coming, and moved on to meet our friends from Guadalajara. 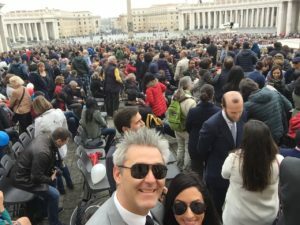 The papal gentlemen escorted us to the exit, and we snapped a few selfies on the way out to send home and let everyone know we accomplished our mission. Of course, everyone asked why we posted a picture of us in front of another bride getting something out of her bag, so we labeled the photo a little more clearly. We knew it would probably be a few days before we could buy our official photos online. As we ambled toward our Uber, we felt truly blessed, and truly thankful for everyone who helped make our dream a memory we will cherish forever. 1. Get married in the Catholic Church, or have your marriage convalidated by the Catholic Church. 2. Book a trip to Italy, making sure you’re in Rome on Tuesday and Wednesday within 3 months of your wedding. We went in March and there were about 20 other couples. It’s much more crowded in the summer. 3. Email the American Parish in Rome with your audience request ahead of time. 4. Pack up your wedding attire. All of the Sposi Novelli were dressed nicely, but “wedding attire” is a loose term. 5. Pick up your tickets at the St. Patrick’s Parish office on Tuesday afternoon, or at the Vatican on Wednesday morning. 6. Go to the Vatican in your wedding attire several hours before the audience to get the best seats. 7. Enjoy! Don’t try to take a selfie with the Holy Father. The Vatican photographers will get excellent pictures for you. 8. Pick up your photos from the Vatican Observatory office the next day, or you can purchase them online a few days later. Pro Tip: Bring a bag with a change of clothes – you’re already ahead of the lines so after the audience, you can head straight into the Basilica. Girls- bring comfy shoes for the cobblestones.